My third “date” with Ruth was a long one; four days back in October 2017. We started planning it as soon as it was evident that we had a lot in common and needed some extended together. As it turned out, by the time we actually were able to make the trip, we were already engaged, although we had kept it a secret. Aiding in that effort was the fact that the ring I bought her was too big and had to go back to the artisan not once, but twice. And so we say we were engaged three times before we got married. I proposed to Ruth, the first time, at a covered bridge near Clearfield, Pa., during our second date. Yikes! I know that sounds that like rushing things, but we’d talked two to three a hours a night, plus had sent something like 600 emails to each other by that point. We got to know ourselves and each other during those long conversations and emails, and it just felt so comfortable. Still, actually being with another person for an entire day is a lot different from being able to say “goodbye,” put the cell phone back in the bag and get on with life alone. 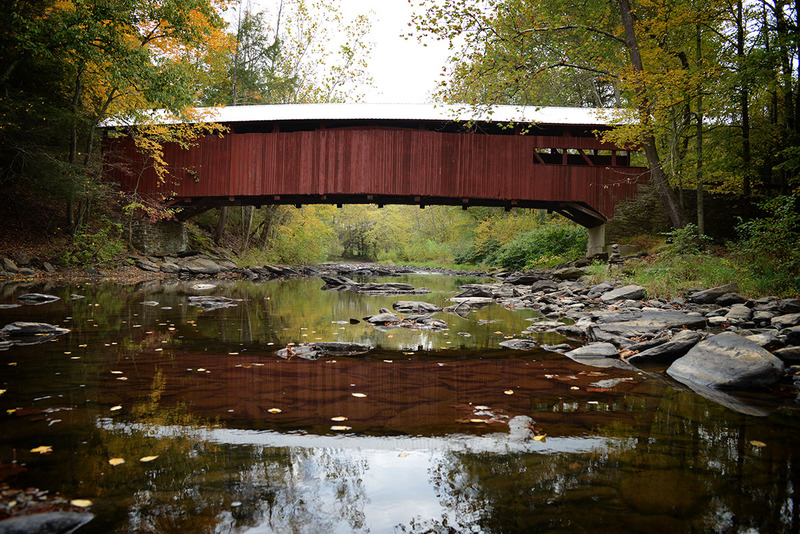 So we planned an all-day adventure in Columbia County, Pa., exploring the covered bridges of a county that boasts Pennsylvania’s third largest concentration of 20 legacy wooden bridges. Ruth was well organized with a picnic that included our favorite meal, cheese and crackers, plus enough beverages and ice to sustain us for several days in the field. In fact, I got so involved in loading her car with the bags of food and plastic silverware, I forgot the tripod from my own vehicle. And so I had to wing it and hold all the shots of the bridges we visited. For architectural and landscape subjects, I use my Nikon D800E and Zeiss optics. Both the 35 f/2 and 50mm/f2 Makro were all I needed. We couldn’t visit all 20 covered bridge in one day, so I picked those of greatest interest and within the same vicinity. 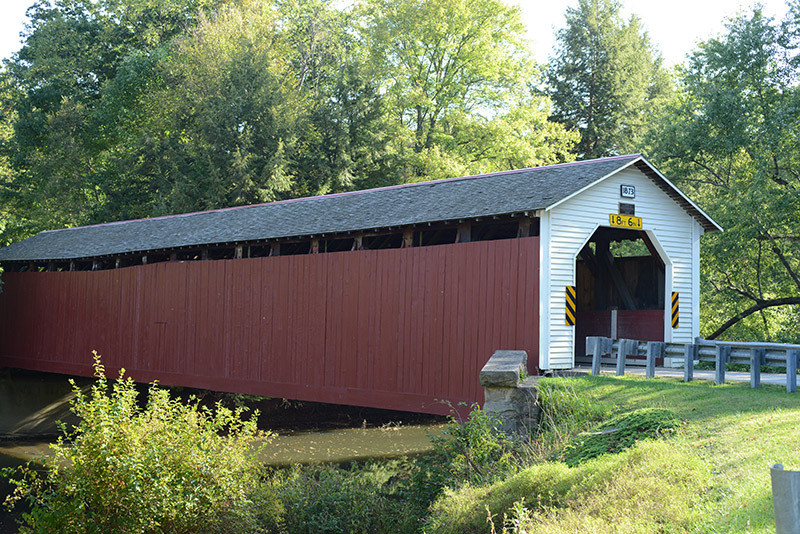 At the top of the list were the East and West Paden bridges (38-19-12 and 38-19-11, respectively), the only “twin” covered bridges remaining in the country. 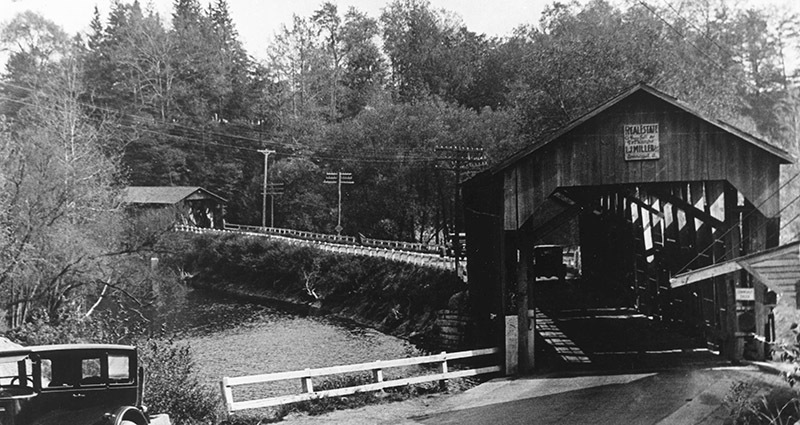 At one time, Ashtabula County had twin covered bridges at Farnham, south of Conneaut. One was over a mill race, the other over the creek. They were on a dangerous curve and by the mid 1920s had been eliminated. The old mill that stood there is, likewise, long one. Back in the days, the 1920s, Conneaut, Ohio, had twin covered bridges at Farnham, the site of a mill. Twin is a bit of a misnomer, for the bridges are of different design, despite being built by the same builder and in the same year. W.C. Pennington charged $720 for the two bridges, named for John Paden, who operated a sawmill nearby. While the East bridge is original, the West structure is a “reconstruction,” the original bridge having been washed away by a flood in June 2006. These are not working bridges; they were bypassed in 1963 and repurposed as the centerpiece of Twin Bridges County Park. Picnic tables benefit from their coverings. 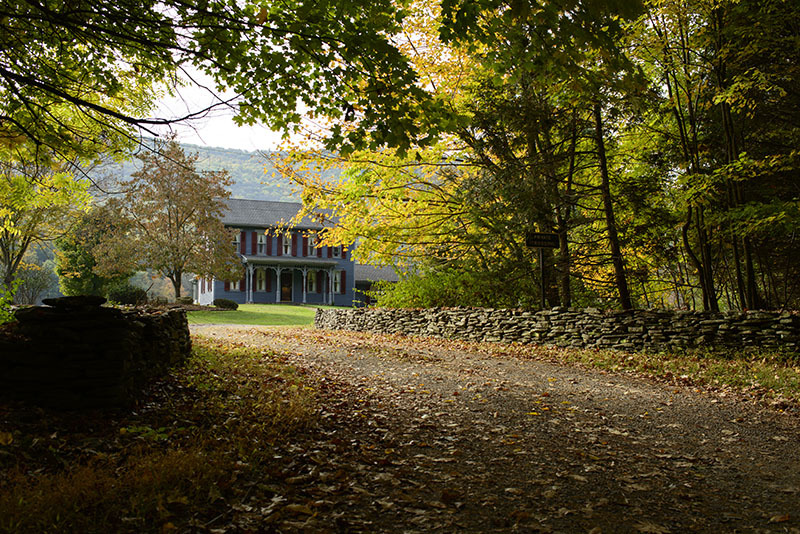 We crossed the bridges and strolled down the lane to the driveway of a beautiful farmhouse, a photo of which now hangs in our living room, a sliver of a memory from that date. A stone wall along the driveway and lovely lighting drew me to this private residence near the East and West Paden covered bridges in Columbia County, Pa. The bridges we visited were all painted red, which turned out to be the most colorful subject matter on this October journey. The fall of 2017 will be remembered by landscape photographers in the East as one of the dullest and most uneventful in recent memory. That said, we did come across some acceptable foliage change along Huntington Creek, Fishing Creek Township. The Josiah Hess bridge awaited us here. This delightful Burr arch bridge is 110 feet long and was built in 1875. It has a very pronounced camber, or slight arch, to the deck. Ruth soaked up the scenery while I went to work photographing the bridge under less-than-idea light. At least it wasn’t raining. By the time we reached the Patterson Bridge, the sun had busted through the clouds and the light had become too contrasty for my tastes. This little bridge spans Green Creek and was built in 1875. It has windows on one side, and slanting roofs extend from the bridge to prevent water from entering from the windows—after all, the whole purpose of covering the bridge trusses was to keep water and weather off them. I’d never seen this treatment before on a covered bridge. Our travels also took us to the Fowlersville and Kramer covered bridges before we decided it was time to get ice cream. We found some at a huge crafts fair near Bloomsburg, then headed toward a spot Ruth recalled from her childhood, one that promised a vista of the Susquehanna River and sunset. It sounded perfect to me; the engagement ring was in my pocket, and I figured a sunset would be a great setting. But we never found the place and ended up watching the sun’s departure over a pasture as we searched maps and the GPS screen in the car for the wrong turn we’d taken. So on the way back to my motel room, I asked her to pull off in a park and take a walk. Turns out the park was in the shadow of a nuclear power plant, not the most romantic spot in the world. We started walking toward the river, but the mosquitoes were bad, so I just stopped and gave her the ring, which was too big. We laughed and hugged and promised we’d get engaged a third time. And we did, without benefit of covered bridges, in Clearfield, on the fourth date. The gallery located on the home page exhibits a selection of images from our outing, one of what we hope will be many, many more in the back roads of the Eastern United States.